Which iPod sounds the best? It seems some folks take this question very seriously: Mark Heijlingers recently compared the frequency and impulse responses of two iPods using a pretty minimal setup of his mac's built-in line in and Fuzz Measure. Looking at the curves, I can only say I'd be shocked if someone using the included earbuds could hear the difference -- both are quite similar -- but he certainly makes the case for an audible difference in sound quality when using, say, a nice pair of headphones. While I am glad there is interest in improving sound-quality, I doubt most consumers care that much. Truth be told, I don't care that much because when I'm using my iPod, it's usually in noisy environments anyway. But if it weren't for people who cared a lot, the sound quality would probably be a lot worse than it is now, so I certainly applaud the effort. 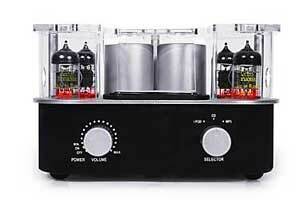 Not to mention the fact that without audiophiles with iPods there would be no place on the market for wacky products like the vacuum-tube-based Music Cocoon MC4 by Roth Audio. Thanks to Chris Pepper for bringing this to my attention. My mom just got me an iPod Touch and I love it! I think the sound is amazing but I am not a good judge because my ears are old and failing. I'd be interested to see how the iPod Touch does on tests. Apple has to cram a lot of technology into a tiny package on those things! BTW, terry, your ears are probably better than you think: most mastering engineers are older than you. Bob Katz, for example, has hearing that is, in the words of a friend of mine and a friend of his: "absolutely uncanny: he can hear things you shouldn't be able to hear." But in his book, Katz insists, "Ear training is actually mind training." Another great recording engineer I knew, George Blood, also older than you, once remarked: "it's funny that even as my hearing gets worse, my hearing gets better," because he was learning to hear things he couldn't hear before.